After years (decades?) of warnings that robots are coming to take away our jobs, it’s about time we acknowledge that they’re already here. Just look around and you’ll see that artificial intelligence (AI) has infiltrated almost every industry and profession – including sales. In fact, according to the McKinsey Global Institute, about half of a sales rep’s workload consists of activities that can be automated by AI. But that doesn’t mean AI is a threat to your job; in fact, it’s quite the opposite. There are many potential benefits of using artificial intelligence in sales. Let’s take a look! Artificial intelligence is here to stay – and sales AI will continue to change the way you sell. 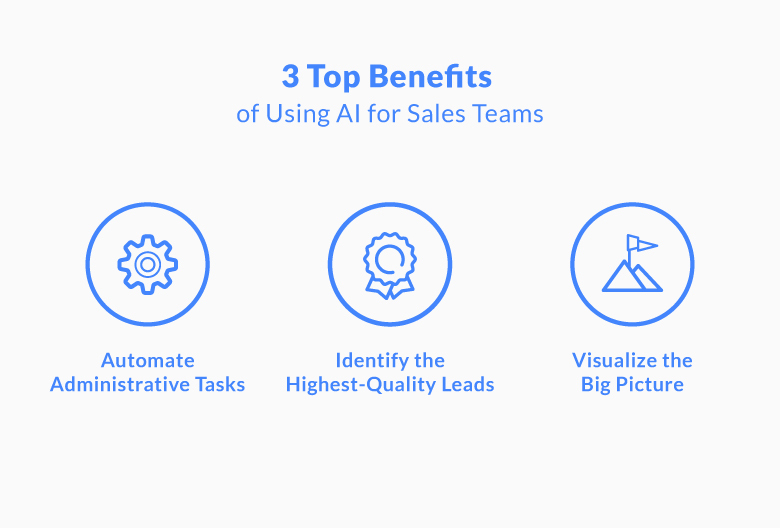 Here are three of the top benefits of using AI for sales teams. The more time you spend logging data and organizing your calendar, the less time you have left to spend selling. With AI, you can automate repetitive admin tasks and focus on what you do best: generating leads and closing sales. Of course, there are also non-AI solutions that can help with administrative organization and planning, like G Suite tools and a CRM platform. When you’ve got a list of potential leads, how do you choose which ones to spend the most time targeting? Machine learning removes the guesswork by studying customer profiles and buying patterns to help you spot the very best leads. AI can factor in a variety of customer traits (like location, company size, industry) as well as behaviors (like which page of your website they spent the most time on and which piece of content they downloaded from your blog). When you have so much information and customer details to keep track of, it can be hard to keep the big picture in mind. For example, say you’re assigned to a major account and need to get up to speed on what, when, and why they typically buy from your company. AI allows you to make sense of large data sets – like the many emails, appointments, and interactions your company has had with a particular buyer in the past – to give you up-to-date contextual information on the account before you hop on that next sales call. How Will AI Impact the Sales Process in Years to Come? Although AI is already here, the technology will continue to evolve and become more accessible over the next few years. This will enable sales teams to tackle complex sales, work more efficiently, and optimize use of their resources. AI will help sales team tap into specialized data that helps them understand how potential buyer’s make decisions. Not only will sales reps will be able to make more informed decisions, but they can even discover ways to apply customer insights to increasing conversions, reducing churn, and boosting productivity. 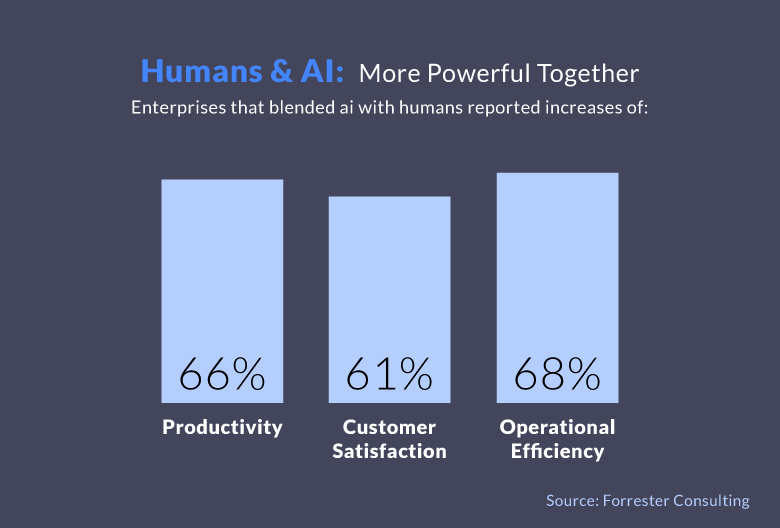 In fact, according to research by Forrester, businesses that combine AI with human insights experience a 66% boost in productivity, a 61% increase customer satisfaction, and 68% greater operational efficiency. By now you’re probably wondering how AI can assist your sales process today. Well, there are several popular tools that use smart technology to simplify different aspects of the sales process. CrystalKnows uses data and language processing to determine whether the tone of an email matches the preferred communication style of the recipient. So, rather than sending generic follow-up messages, you can craft messages that appeal directly to your prospects. Even though Calendly isn’t a true example of AI, it still uses technology to take care of an annoying administrative task. It adopts the role of your personal assistant when it comes to scheduling meetings. Instead of emailing back and forth to figure out a time that works for everyone, you can send out a link to your calendar and your prospects or customers can choose an open time slot that works well for them. Clara is an actual AI assistant that handles the back-and-forth messaging to get your meetings scheduled and confirmed. Simply CC Clara on any of your emails and ask it to schedule an appointment with the recipient, and the AI will take care of the rest. You can even personalize Clara’s identity by changing her name or gender. 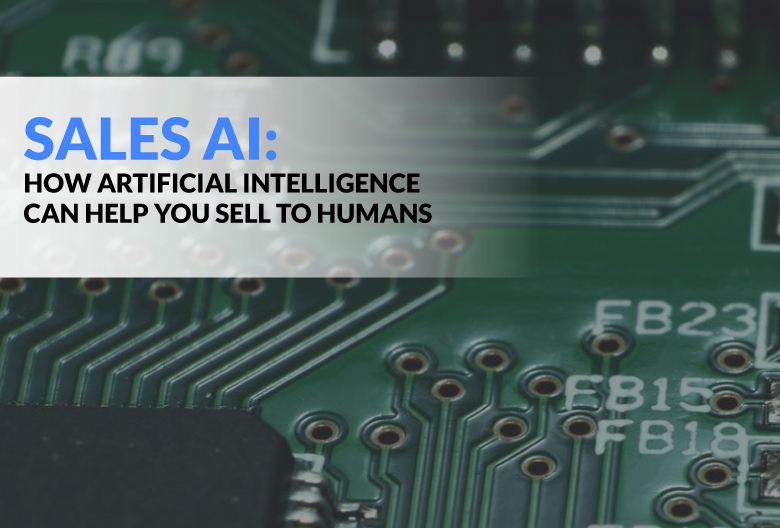 While AI can’t replicate the human connection at the heart of most successful sales (at least, not yet), there is certainly a place for AI in your sales process. Tools like Clara and CrystalKnows can round out your sales stack and push your success to the next level, especially when used alongside a modern CRM like Propeller. Want to help your sales team tap into the power of technology? Start using Propeller CRM for free today! Propeller takes care of data entry and automates repetitive tasks, so you can focus on making sales.